It looks like venizian glass, or a drop of water reflecting its surrounding, being colorful dots. clown drop :) reminds me of glasswork, maybe a bead in the making, though I know it's not...you did a good job with that ref. Thanks!!! It reminds me of Wonder Bread! wow, it looks just like it. That's a great realism pic. Your improving. Yeah, I've seen the mousepad with those spots before, great job on this. If a clown cried that would be what it would look like!!! Great job, Dave!! friggin trippy-made me think of a lava lamp for some reason. had to DROP by and tell ya this is awesome!!! great job! I didn't comment? I didn't comment? The one pic I kept coming back to look at and it was one of those brain freezes, you know how it happens. Everybody said what I wanted, to how well done the compisition is to make it look like water (or glass) to the clown reference so I'll say instead Poppa, *WowiewoiewowowoW* \0__o/ The upper right part looks like ice. Ha..you're as bad as me Barb!! hahaha.. yea.. I don't know what the drop was hangin from..looked like ice to me too.. I'll have to ask sortvind what he used. Ooooohhh I haven't seen this until now....this is cool! I like it a lot! This is yours Dave? I seen this and kept thinking "how cool is that" but never got a chance to comment on a lot of drawings at that time. I had just about enough time to check in to see the new ones. This is too cool for words. I love the reflection in the droplet. I love the droplet itself. Cameo's comment about clown tears, is also incredible because that is what this looks like to me too. Awesome draw...just awesome! Sorry, I hate editing comments...but I went to the link that you posted on the original. I seen one there I would love to try, but I would hate for you to think I was trying to copy your draw. 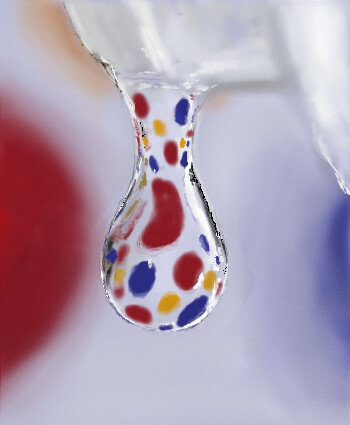 I have always wanted to do a successful water drop, and the version 3 of this might show up here sooner or later if I ever have time to complete the three that I already haved saved waiting to get done. It's the best looking photo of a clown ever.